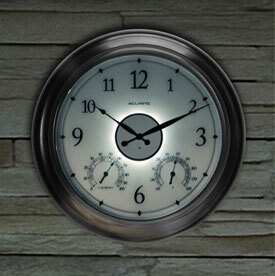 Find the perfect indoor clocks, alarm clocks or outdoor clocks, for any space in your home. Style a bedroom with a decorative clock, provide additional function with a digital alarm clock in your home office, or track the weather using an outdoor clock with thermometer and humidity sensors. 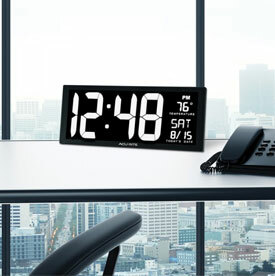 Shop all clocks from AcuRite’s online selection, ideal for placing anywhere from a bedroom to the kitchen to the patio. We offer a wide variety of analog clocks and digital clocks, including alarm clocks, outdoor clocks, indoor clocks, wall clocks, decorative clocks and more. Looking for a multifunctional clock? Choose a versatile digital alarm clock with easy to ready numbers for your office, bedroom or classroom – great for kids learning to tell time or elderly members of the family with poor eyesight. Or upgrade to an alarm clock with weather forecast features, time and date, indoor & outdoor temperature and indoor humidity, ideal for any room in your home. Projection clocks that display the time or temperature on the wall or ceiling can be used indoors or outdoors. Other features include an alarm clock, smartphone USB charging port, calendar and moon phase tracking, and automatically adjust for daylight saving time (DST). Choose one of our high-precision atomic clocks that are radio-controlled to consistently maintain the correct time. Bring style and function to your home with one of our wooden or wrought iron metal decorative clocks, such as mantel clocks, wall mounted clocks or pendulum clocks, available in modern or classic style designs. Looking for or a multi-purpose home device? Browse our indoor and weatherproof outdoor clocks that include helpful features such thermometers and hygrometers as well as LED illumination for easy readability at night. Plus, browse our clock parts to easily find replacement clock parts for your products. 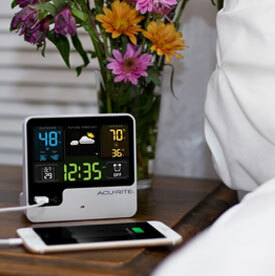 AcuRite provides you with the leading weather stations and home monitoring devices to ensure your home is equipped with the home technology it needs to run efficiently inside and outdoors. Shop our weather stations for everything from basic weather stations to high-tech 5-in-1 weather stations, and supplement your home monitoring environment with other devices such as hygrometers, rain gauges, lightning detectors, weather alert radios, thermometers, and more. Not looking for a weather station? We also specialize in indoor clocks and outdoor clocks, kitchen devices, gardening tools such a soil meters, and other home monitoring technology. Browse our wide range of home technology products or shop our weekly deals to find the perfect device for your smart home.